Minus a brief reference to ham on page 16, this 52-page book (received as a review copy) is one I wished was in my library when I was a young gal. Adorably British, this elementary reader centers on a delightful little pixie named Posie who wanders through a charming woods on her many adventures. In this particular title in The Whimsy Wood Series, Posie is seeking blackberries for making pies and jams. En route she encounters all sorts of wonderful creatures: Wibble Woodlouse (who wears a coat decorated with pumpkins), Raspberry Rabbit, Mrs. Spottisdowne sparrow who speaks in a fun Irish accent, and a band of enigmatic ants. The sparrow helps mend Posie’s tunic, which is the main issue in this story, and illuminates the reader on what the adage “a stitch in time saves nine” signifies. 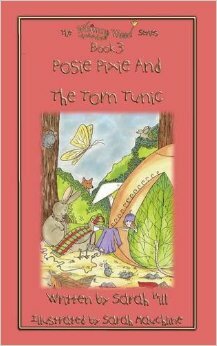 Parents and children alike will enjoy the atypical verbiage found in Posie Pixie and the Torn Tunic: whilst, scurried, idle gossip, scrum-diddly-umptios, and other fun words. Trying to speak like Mrs. Spottisdowne will also be a laugh-out-loud experience, I think.